Born 24 July 1875 in South Bank, Middlesbrough, North Riding of Yorkshire [registered in Guisborough, September 1875]. Registration notes The registration district of Guisborough is correct. The parishes of Eston, Normanby and Ormesby (which all surround South Bank) were transferred to the Middlesbrough registration district in October 1875. According to the 1881 census, Alfred E. is the youngest of nine children to William and Mary Jane (née Hill). They (parents and seven children) live at 51 West Terrace in Normanby, and his father is a pig metal carrier in the local ironworks. According to the 1891 census, fifteen year-old Alfred Ernest remains the youngest of four children living at home with their parents, he is a fitter on steam engines, his father is now a dock labourer. They live at 85 Nelson Street in South Bank. According to the 1901 census, Alfred E. is a professional footballer living at 8 Guest Road in Ecclesall in Sheffield. He is married to Ann E., and they have a one month old son, George W.. His parents-in-law and brother-in-law also live with them. According to the 1911 census, Alfred Ernest is a professional football club manager living at 4 Sandringham Road in West Hartlepool. He remains married to Ann, but their first son has died before he reached his first birthday. They do have another four children, Ronald, Florence, Eric and Olive. His widowed mother-in-law live with them. to Ann Eliza Richards, on 26 February 1900 in Bakewell [registered in Bakewell, Derbyshire, March 1900]. They had eight children, apart from the five mentioned in the census', those that arrived after 1911 were Frederick, John A., and Cissie. Cissie also died within her first year. 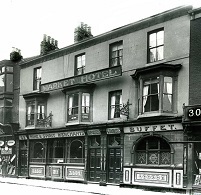 Died: 5 May 1922, died of cirrhosis of the liver, at Market Hotel, Lynn Street, West Hartlepool, aged 46 years 285 days [registered in Hartlepool, county Durham, June 1922]. Buried in an unmarked grave (left) in West View cemetery, north Hartlepool, on 9 May 1922. "Rev. Bertram-Jones officiating. The cortege was headed by members of the Order of Knights of the Golden Horn, and following them were a large number of mourners, including many footballers". On 11 October 1922, Hartlepools United FC took on Sheffield United FC (including several Wednesday FC players). The gate money was given to his widow and young family. Height/Weight 5' 8", 12st. 4lbs , 5' 8", 12st. 12lbs . Club(s) Started his career with the newly formed South Bank FC in Middlesbrough as a junior in 1885. It was Sheffield United FC that signed Priest in 1896, allegedly whilst sat in a bath in Newcastle, after South Bank had played there. After 209 league appearances and 72 goals, he returned to his native Teesside when South Bank FC re-signed him in December 1905. Middlesbrough FC signed him in October 1906 as a player, as well as an assistant trainer, he made thirteen league appearances. Two years later, in the summer of 1909, he crossed the River Tees to join the newly formed Hartlepools United FC as their player-manager, he retired from playing in December 1908 after four North-Eastern League appearances. Club(s): Became player-manager of Hartlepools United FC (left) as they formed in 1908. He held the managerial position solely from 1909 until 1912. Priest managed 145 matches, of which 68 were wins, 37 draws and forty losses, 311 goals scored and 179 goals conceded. Player number One of five who became 247th players (251) to appear for England. Only match No. 68, 17 March 1900, Ireland 0 England 2, a British Championship match at Lansdowne Road, Ballsbridge, Dublin, aged 24 years 236 days. Distinctions Priest had a Welsh mother, so Fred could have played for Wales. Became a licensee, where he remained right up until his death. 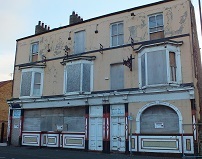 He died whilst living and running the Market Hotel in Hartlepool (left and right, then and now). - An English Football Internationalists' Who's Who. Douglas Lamming (1990). Hatton Press, p.200.